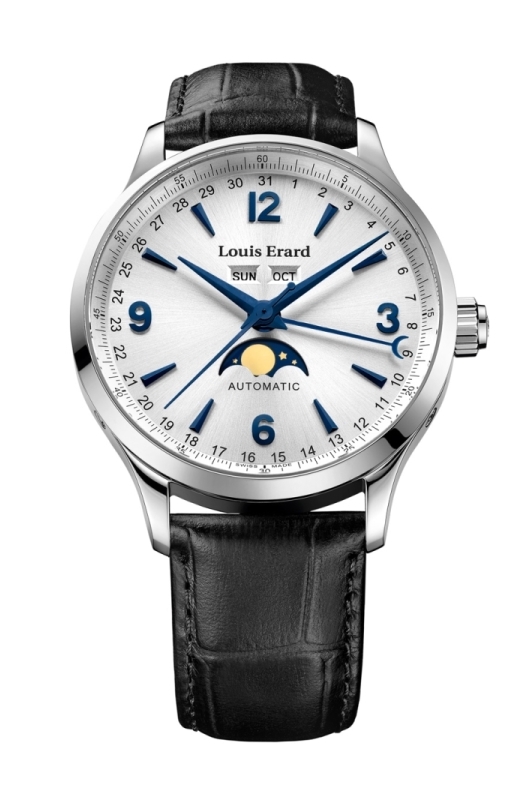 The name Louis Erard might not be immediately recognizable to those not entrenched in the watch world. 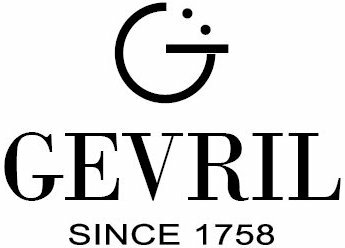 The brand flies a bit below the radar, but this is a good thing because now you can be let in on a secret not too many people know about. 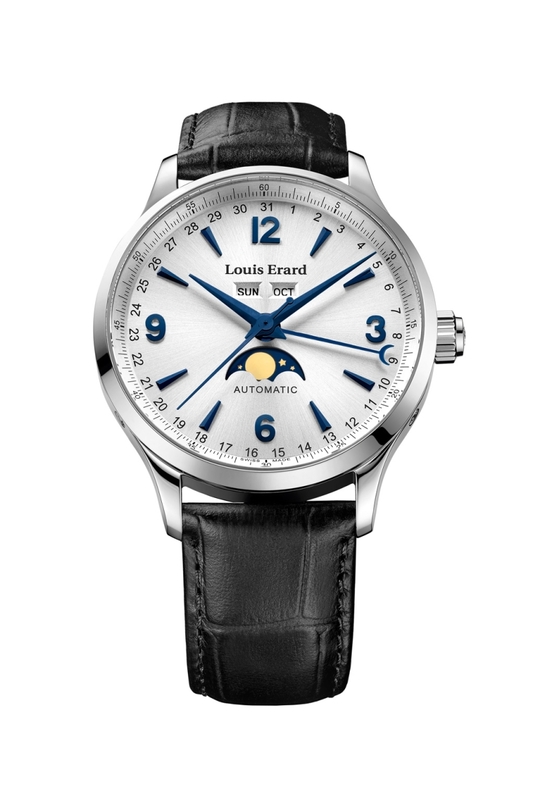 Louis Erard makes great Swiss watches and they have been doing it under their own name since 1931. While the majority of watch houses put resources into quartz movements, Louis Erard made the decision to make house only mechanical movements, putting the mechanics center stage. 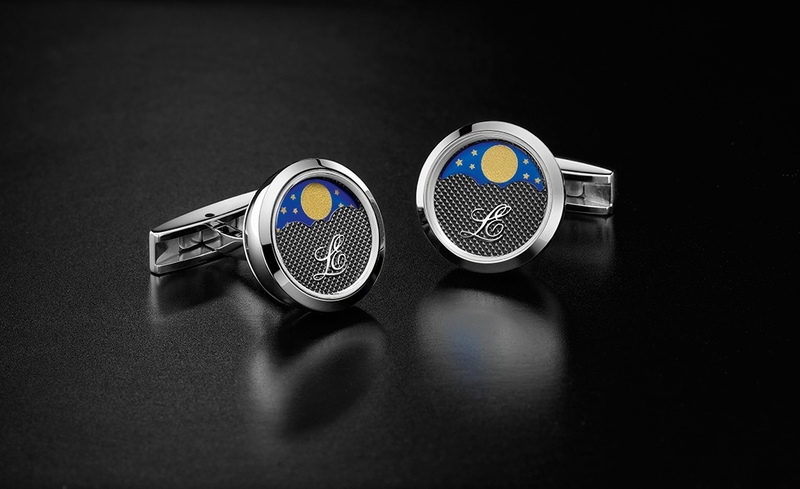 The Louis Erard 1931 Men’s Moon Phase watch and cufflinks combination pays homage to our glowing orb in the night sky. In a nice-sized 42 mm stainless steel case, the 1931 Men’s Moon Phase watch features a silver-toned dial with a glorious yellow moon against a starry background at 6 o’clock. While the eye pulls towards the shapely crescents of the moonphase, its design doesn’t overwhelm the composition. Time ticks away on blued hands circling Arabic numerals and dagger hour indexes plus a blued seconds hand with a moon-crescent at its tip. The Louis Erard 1931 Men’s Moon Phase is more than just its name implies. In addition, the timepiece also incorporates a calendar with a day and month window sitting side by side underneath 12 o’clock and a blued pointer index circling the dial to indicate the date. The black leather strap with folding clasp that complements the silvery dial secures the watch to the wrist. This watch is not only classy and well-designed, it’s also very functional. 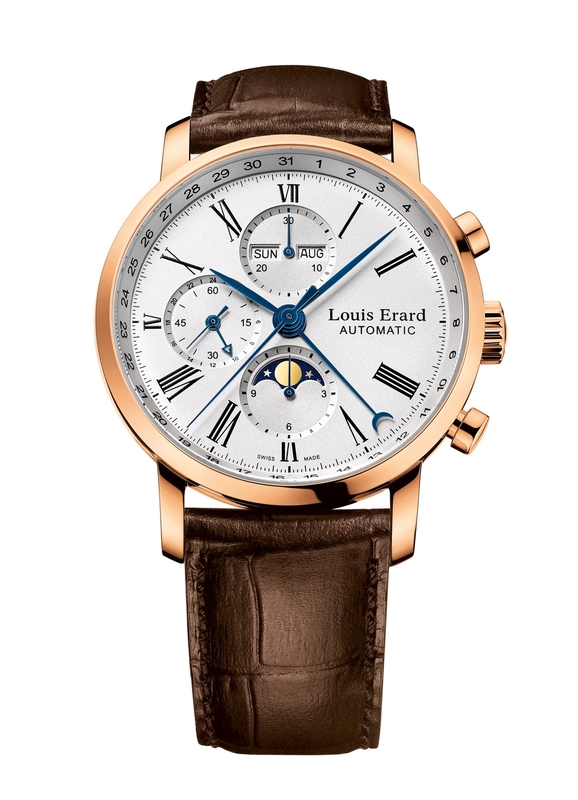 True to the Louis Erard philosophy, the 1931 Men’s Moon Phase runs on an automatic ETA 2824 calibre with Dubois Dépraz 9000 complication. The mechanics can be seen on view through the sapphire crystal caseback. 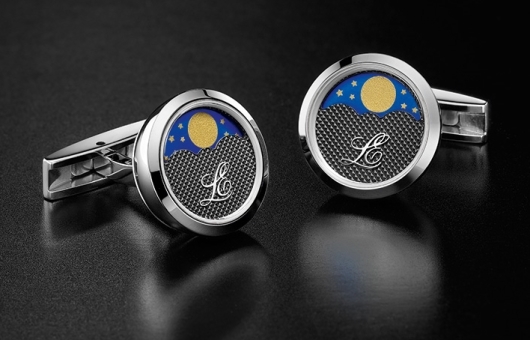 Putting icing on the cake, the Louis Erard 1931 Men’s Moon Phase watch comes with matching steel cufflinks composed of central moonphases under mineral glass. This special edition duo comes in a beautiful presentation box. Purchase your Louis Erard timepiece from an authorized Louis Erard dealer. 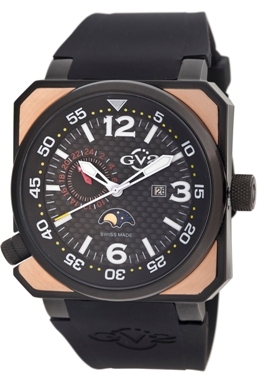 This uniquely masculine GV2 timepiece combines the practical easy-to-read dial of a fine pilot’s watch with a bold, architecturally inspired design that will look fabulous on any man’s wrist. The large, aviator style round dial is encircled by a dramatic, square-shaped beveled edge case featuring a rose gold face with contrasting black PVD sides. World travelers will appreciate the 24-hour subdial at 9 o’clock. This dial can be set independently to display GMT or any secondary time zone. There is also a date display at three o’clock and a beautiful moon-phase indicator at six o’clock. The oversize 49mm XO Submarine watch is powered by a high quality Swiss-made quartz movement that has been engineered to provide years of reliable service. The PVD coated black stainless steel case is water resistant to 165 feet and comes fitted with a comfortable caoutchouc strap that complements the design perfectly. With its signature multi-colored, red tipped hands for hours and minutes, this watch will garner attention and start conversations wherever you go. Like all GV2 watches, the XO Submarine Moon Phase Black Dial Watch represents a tremendous value. The robust quality and attention to detail found in this watch is exemplary. 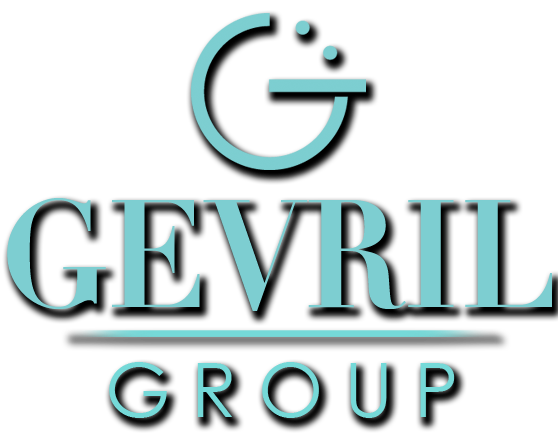 It’s exactly what you’d expect from Gevril. This is definitely a timepiece for a man who knows his own mind and isn’t afraid to let others know what he thinks. If you’d like to experience what it’s like to make a statement that’s hard to ignore, look for your nearest authorized GV2 dealer and reserve your XO Submarine Moon Phase watch today.